It’s that time again! This week has just flown by. This might be long, because I took a whole bunch of pictures this week. 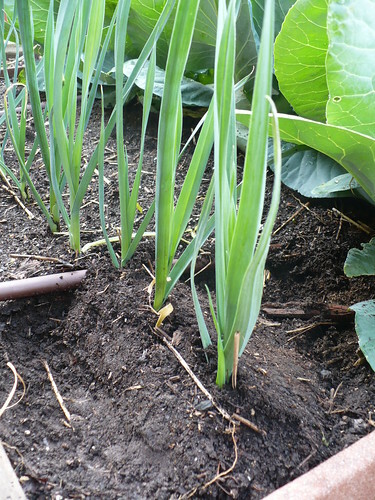 The leeks we transplanted this spring are growing like crazy. We hilled them up a little bit this week, to encourage them to have nice long white stems. We’ll have to find some mulch or compost to hill them up more in a couple weeks. 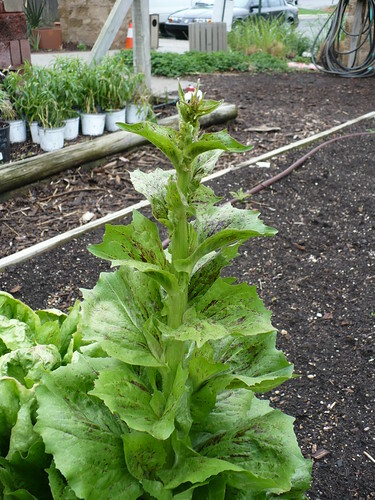 Our beautifully photogenic radicchio is no more…It decided that the hot and cold temperatures were more than it could handle and started bolting. (Bolting is another way of saying that it was putting up a flower/seed stalk.) 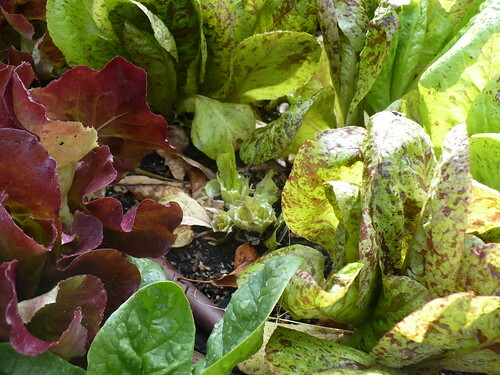 Most leafy greens are no longer edible once they’ve started bolting. 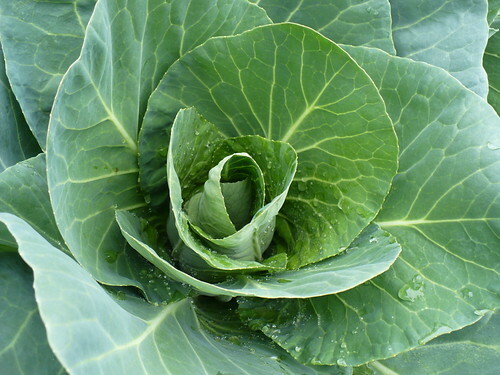 The ‘Caraflex’ cabbage is beginning to roll up the center leaves to form a head. This is a mini cabbage that will have a conical shape. You can sort of see that shape developing already. 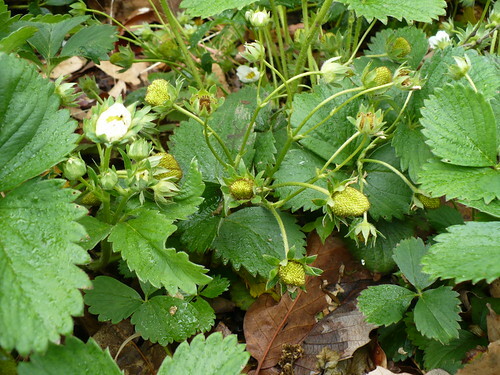 The strawberries are absolutely loaded, and they seem to show no signs of stopping blooming! How many potential red, ripe strawberries do you count in this picture? (Hint: I got well over 30 before I lost track of which ones I already counted!) And this is only about 1 sq. ft. of our strawberry patch. Yikes! I hope we get enough rain to produce large berries. The ornamental alliums are the big, showy splash in the middle of the garden right now. Aren’t they stunning? Our obnoxiously thorny gooseberry bush is once again loaded with fruit. 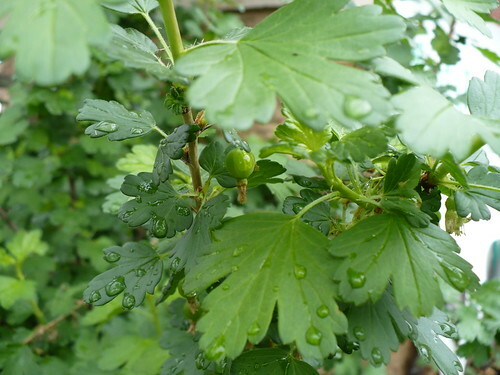 Our thornless gooseberry bush once again has almost no fruit on it. There must be a correlation between thorns and fruiting volume! The cool season veggies are sure growing by leaps and bounds! The unimaginative might just see this as green, green, and more green. I would challenge you to look again and see how beautiful and artistic the different shades of green are, especially in combination with the different leaf textures! I guess I got so excited to post about aphids yesterday that I completely forgot about Video Wednesday. So this week we’re having Video Thursday! 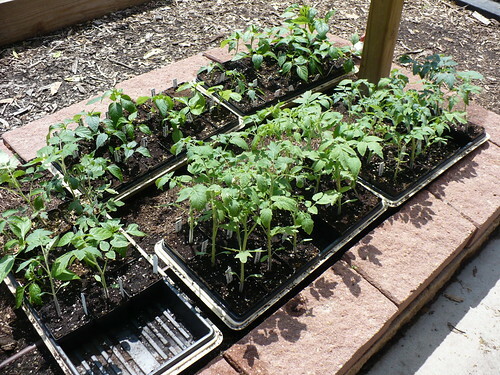 How do you keep your vegetable plants spaced appropriately when you are planting? 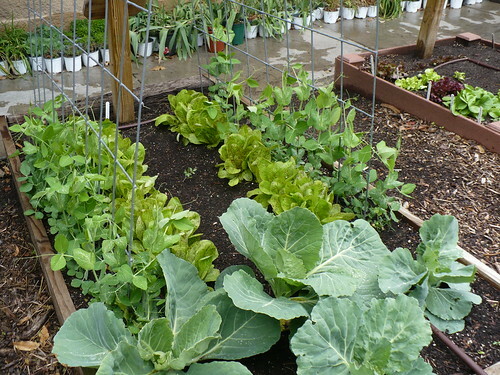 Ward Upham shares a simple tool that can really help in the garden. Tomatoes and peppers in my office are growing like crazy, and at 4 weeks old, it is time for them to start getting some sun outdoors. Yesterday they spend several hours out in the garden, enjoying the cool, sunny weather with minimal wind. I hope the weather is nice next week, because these guys definitely need to get outside more! Unfortunately, the flats of peppers that were on the lowest shelf of the light stand have been infested with aphids. I suspect that the aphids came from the rosemary plant that has been residing in my office. 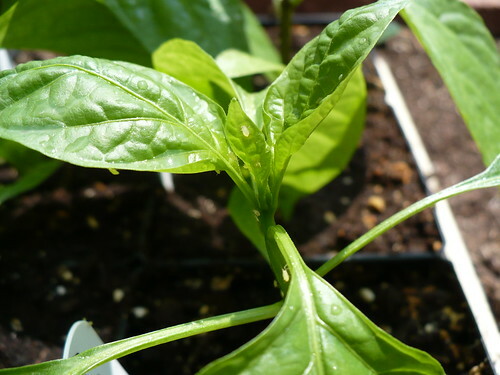 You can kind of see several aphids on this pepper plant. I got some neem oil/pyrethrin spray and gave all the peppers a good dose of it. As soon as the plants have dried, I’ll bring them back inside. I’m afraid of leaving them out too long with an oil spray on them, because it might result in the leaves getting a little too scorched from the bright sunlight. Hopefully that will keep the aphids in check until we get everything planted. We had our first big harvest day for the spring out of the Family of 4 Garden. Lettuce, more lettuce, spinach, and radishes were all ready for a harvest. The ‘Skyphos’ Red Butterhead lettuce is gorgeous, as expected. 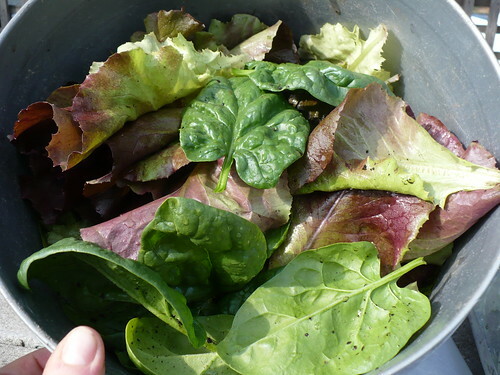 We also harvested some spinach and some of the ‘Flashy Trout Back’ Lettuce. We harvested about every other plant down to the ground, and then picked the largest leaves off of the remaining plants. The plants we cut near the base will regrow more leaves. We can cut the other plants next week. We’ll have to pull some plants next week, because we need to get the tomatoes planted in that area! 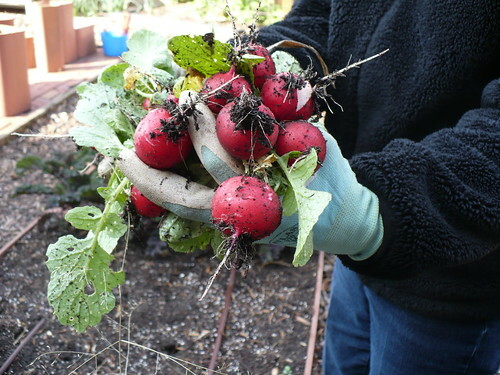 There’s the bunch of radishes. Aren’t they gorgeous? Everything was a little muddy today, but we aren’t complaining because we finally got some rain! We measured about 0.8 inch in our rain gauge. 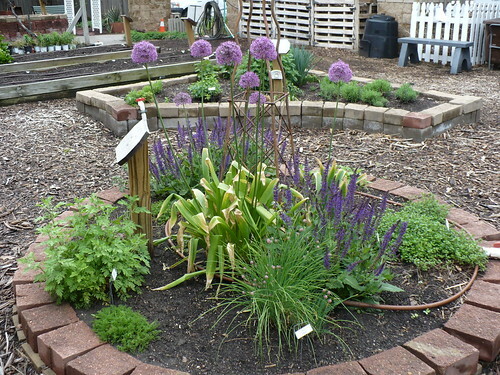 One of the things that I’ve really enjoyed doing in the past few weeks is going out and visiting a number of the community gardens that our Master Gardeners are providing grants to. It has been exciting to see the ways in which these gardens are trying to make access to fresh vegetables a reality in their communities. Along those same lines, we are getting ready to kick off the 2011 Plant a Row for the Hungry program. It is a good reminder as we are planting our gardens that anything extra (either that we plant or that we just produce more than we can eat) can be donated to the Kansas Food Bank. There will be more details coming in the near future about the details for the program this year. Last year, gardeners in Sedgwick County donated 77,987 pounds of fresh produce to the Kansas Food Bank! Wow! You guys are awesome!